It’s no secret that your online presence is much more important today than ever before. Branding your career as an executive is a powerful way to take complete ownership of your online brand in a way which will draw people and business opportunities to you and your company. First, let me clarify what the mindset of Authentic Career Branding is. The secret lies in the power of having a Go-Giver mindset, sharing your thoughts, vision, and personal opinions through your personal website and blog. When we share our knowledge, we tend to attract people with the same interests. People who can get to know, like and trust us. 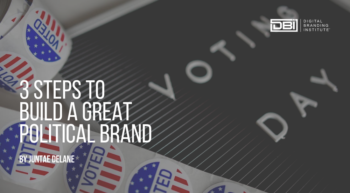 There are so many ways you, as an executive, can benefit from having a strong and authentic digital brand for your career. Here are a few reasons, why you should consider building your online career brand. When you begin to share your thoughts and opinions about what goes on in your industry, you can carve a space for yourself as a thought-leader which will naturally start strengthening your position within the field you’re in. Once you start sharing your knowledge and insight on your personal career website, you will build your own professional knowledge base, that over time will help you become a thought leader in your industry. 3. Reach more people with your message. Create an audience by establishing and promoting a blog. Blogging will give you a platform to be able to reach people with your message. With a blog, you have an information base you can use to attract people to you who have an interest in your industry. 4. Help your company become more visible. Share your knowledge on social sites like LinkedIn and Twitter. When you start sharing your thoughts and engaging with others your brand can become more visible in the online space as well. 5. Attract new business to your company. Use content marketing to generate leads for your business. Create blog posts that solve client problems and collect information through your subscribe form. If you create the right content, you might even bring a new level of connectedness to your company among potential customers and your current customers by providing value. 6. Attract the right employees to your team and company. Another positive side effect of establishing your digital brand is that you’ll be able to attract new employees to your team and company. When people resonate with your brand and values some of them will begin to look for openings at your company. The reason it’s so important to build your digital brand as an executive is to take ownership of who you are online. Having your own website and blog is the only way you’re in control. Yes, you could blog on LinkedIn and have a mass of people you can reach, but what happens if your account gets hacked or their policy changes? I’m not saying you shouldn’t publish blog posts on LinkedIn, or on any other platform for that matter.The key takeaway is you don’t want to base all your valuable content and contacts where you’re not in control. What are some ways executives can benefit from career branding? Anything you want to add? Let me know in the comments.